Belly dancing is often viewed as an exotic Middle Eastern dance meant to tantalize and seduce men. 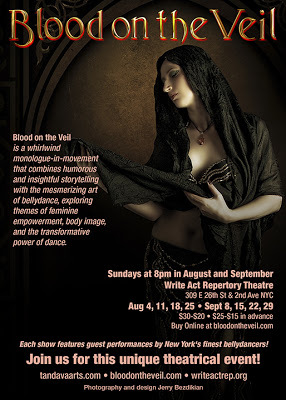 However, in Carol Tandava Henning’s “Blood on the Veil: A Bellydancer’s Journey Towards Healing, Transformation & the Divine Feminine,” she introduces and unravels the sacredness of the dance. Tandava speaks of her body image issues, health problems and perseverance to become a dancer despite society’s discouragement over the years. There are so many misconceptions about belly dancing and Tandava covers them all through her heart shaking and inspiring stories. Tandava, a tall, pale, woman with brunette hair long past her waist, bore a subtle smell of nickels and roses. You could not possibly imagine where a woman so confident and statuesque could find flaw in her beauty. During the one-woman-show, that feature three other dancers in skits, Tandava speaks of body acceptance issues during her adolescent years all the way to her gym going, fit-fiend, early adulthood. But Tandava did not always listen to her body or respond well to its outcries for an easier workout regime. After serious abdominal and back pain injuries, major surgery and three herniated discs, Tandava was desperate to find something that would help her heal and strengthen her body. Belly dancing became Tandava’s source of rehabilitation. Through the art of belly dancing Tandava changed her perception of beauty and it helped to expand her self-esteem and self-value. Throughout the play, Tandava tells captivating stories of her journey to belly dancing that are so vivid and worded well enough to make you feel as if you were there with her. It also helps that Tandava talks and dances throughout the whole show; your eyes will be glued to the performance. From the elaborate stories to the beauty of belly dancing you’ll leave the theater interested in signing up to a belly dancing class near you. Do come to the theater in your dancing shoes as well and leave your timid nature and two left feet at the door. Towards the end of the show everyone will be up on their feet showing off their amateur belly dancing moves with Tandava and her featured dancers.